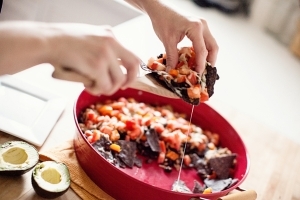 Fully loaded cheesy, meaty nachos for a fraction of the fat and calories in restaurant nachos. Brown and season the turkey; set aside. While that cooks, chop and prepare the vegetables and other toppings. Preheat the oven to 350 degrees F. Spread foil or parchment across a baking sheet. Make a single layer of chips on the baking sheet, then top with all of the ingredients, finishing with the cheese. Bake for about 10-15 minutes, or until the cheese bubbles and melts. Remove and serve immediately with avocado, jalapenos, or salsa.